Bryan + David tied the knot in Tucson AZ. They legally got married in New York. The pouring of love from family and friends was contagious. Even though we had only worked with Jacob Chinn (Jacob Chinn Photography) before, we felt like we had teamed up with the other wedding professionals. All the staff at the JW Marriott at Star Pass created an oasis for the ceremony and reception to happen. Andrew Wagner from Muse Entertainment provided the entertainment and fun games to keep the guests entertained. Gabriel Francisco played background music with his classical guitar during the ceremony and during cocktails. The most touching and emotional part of the wedding was the ceremony performed by their dear friend Michael. Their wedding trailer clip will give you a glimpse of that. Thanks Jacob Chinn for providing us the photos. They give you a chance to see the love, fun, excitment, joy… that everyone had on this festive November 3rd wedding. Till death due us part! 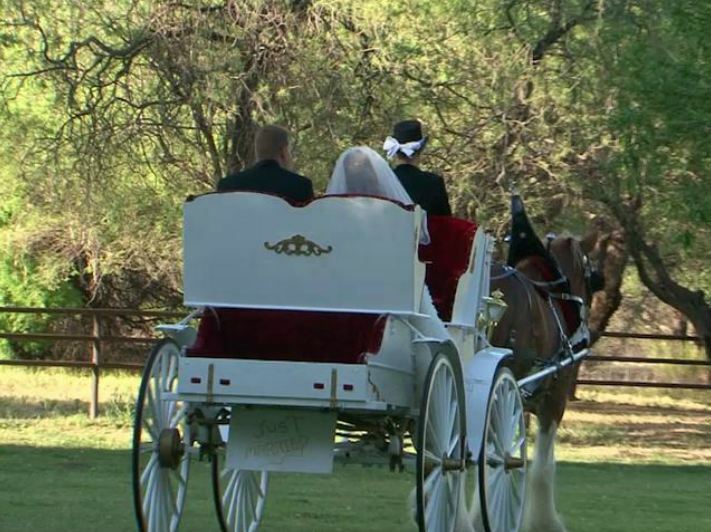 What’s more romantic than arriving at your wedding on a horse and carriage? Enjoy the romance in the wedding trailer. Jen’s attention to detail is evident when you see what she’s created for her wedding to Ryan. Take a peek at their wedding trailer below. We hope you enjoy a sneak peek at Marcy & Tim’s wedding. They were such a hoot to work with and have a great sense of humor. Since they live in Okinawa, Japan we planned an engagement video session so we could get to know them better. That’s when their true personalities came out and we knew we’d love capturing their wedding day for them at Saguaro Buttes in Tucson AZ. Stephanie & Jason had a very simple yet elegant wedding at The Lodge at Ventana Canyon in October. What an amazing couple! Stuart Mattingly, Modern Elegance Photography got some amazing shots. He’s so easy to work with and he makes everyone feel so comfortable. We always look forward to working with him. Cassie & David are one of the nicest couples to work with. Their ceremony was performed by a friend at The Stillwell House right as the sun was setting on October 8th. Check out their wedding trailer! Sara & Cullen got married on the rooftop of the Westward Look Resort in Tucson on a sunny day in May. Sara works in a comedy troop in LA so you can imagine the fun everyone had and the toasts that were given.